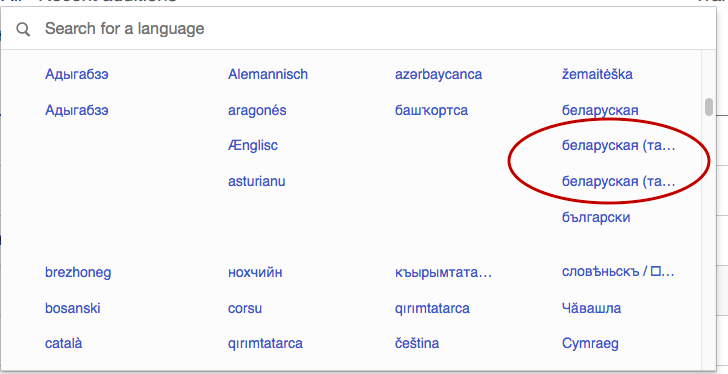 This bug is different from T41921: Languages appear repeated for each region in search results despite being the only result because these happen without searching. Arrbee added a project: Language-2018-Jan-Mar. Arrbee moved this task from Backlog to Priority backlog on the Language-2018-Jan-Mar board. Arrbee triaged this task as Normal priority. • Nikerabbit removed a project: Patch-For-Review. Some of them might be pseudo-duplicates since data-code is not the same. Should the tooltips reflect the difference between languages? (1) Tooltips are the same, data-code is different. (2) Tooltips are the same, data-code are the same. This seems have fixed. Checking for Special:Translate now.. This also seems fixed in Special:Translate (Checked in Meta). Can you recheck @Etonkovidova ? Checked in translatewiki and meta - no duplicates displayed, thx @KartikMistry.